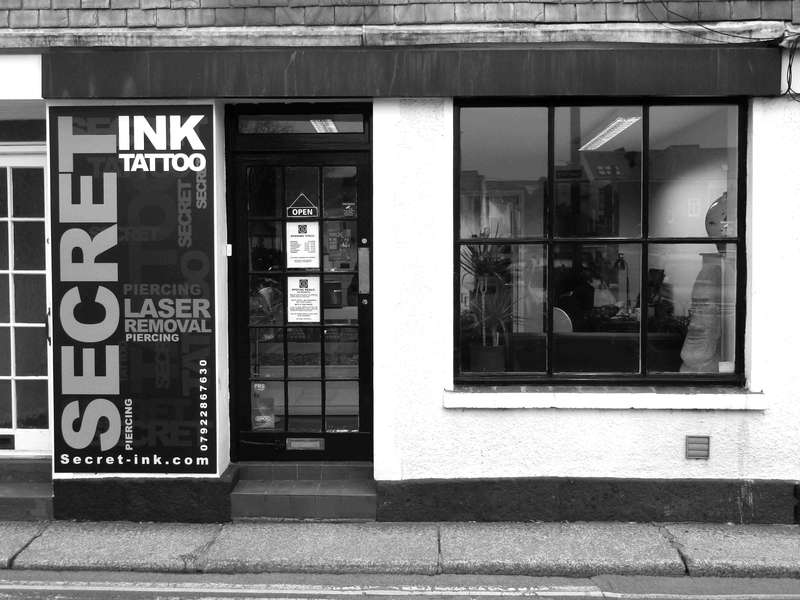 Secret Ink is a UK based custom tattoo, body piercing and laser removal studio in the city of Truro, Cornwall. Our aim is to create a business that changes public opinion of tattoo studios and the traditional tattoo parlour. We want to show bespoke tattooing as a credible art-form, with a studio that is run in a friendly and highly professional way that is accessible to all. Secret Ink is dedicated to raising the standards and reputation of a custom art-form that has too-long existed in back streets and basements. We are determined to provide a safe, friendly customer focused environment, where quality and integrity are paramount. We aim to provide our customers with sound and ethical advice, be they tattoo ‘life-stylists’ or getting their first piece of body-art. We aim to inspire the customer to exceed their own expectations and assist them in creating a bespoke piece, of personal meaning, in standing with the significance of the tattoo experience. 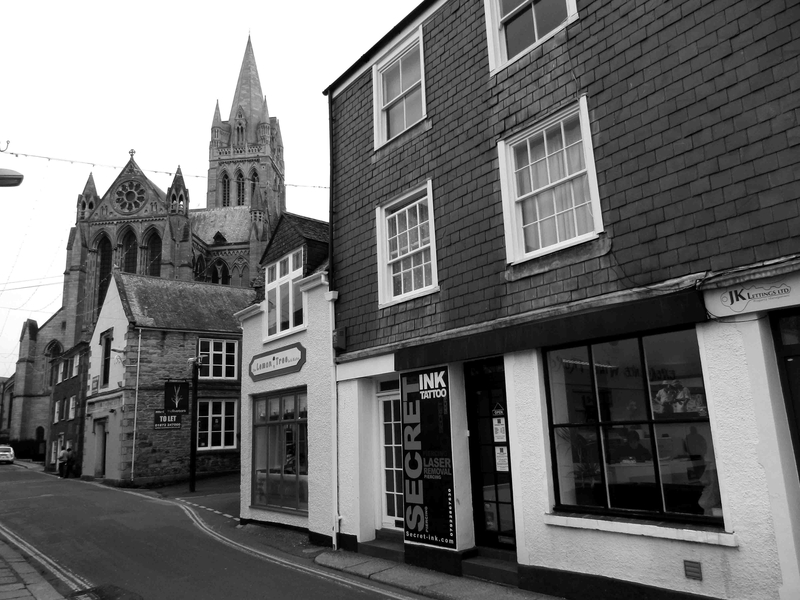 Based in the beautiful city of Truro, within a stones throw of the cathedral, Secret Ink is a custom tattoo and piercing studio with a difference. It's clean cut design offers a relaxed and welcoming environment that is much less intimidating than your traditional tattoo parlour. We have both a tattoo studio and a private treatment room, where we not only offer a clean and hygienic environment for body piercing and our laser tattoo removal treatments, but also provide a gentle setting for our younger customers who are maybe getting their ears pierced for the first time. At Secret Ink our tattooist will work with you, to make your experience with us exactly what you require, while using our extensive knowledge in the industry to help guide your choices towards the end result that works best for you. We believe that we are the premier choice for custom work, and that you won't find a better experience in any other custom studio in Cornwall or the South West. In keeping with our ethos, we do not offer below-the -waist piercings, but will work with you to ensure you get the best from your body piercing. Our piercer is happy to explain any of the processes and spend the time with you that is needed to get the best result possible. We offer ear, nose, belly button, tongue, eye brow, dermal implant piercings to name a few, but you can check out the available piercings page on our website for a more comprehensive list. Finally, here at Secret Ink, you can also get your tattoo removed by laser. We are unique in Truro, as being the only studio which has its own laser on-site along with our own fully trained laser technician. While many studios and parlours are beginning to see the benefits of laser removal, most invest in the cheaper Chinese machines and have no training in their use. You can find more comprehensive information available on the Laser Tattoo Removal section of our website. Please feel free to drop in on us at any time, we are always happy to answer any questions you may have on Tattooing, Piercing, Laser Tattoo Removal, or any of our processes, we don't believe there are any stupid questions. Even if you just want to come down to our studio for a look around, we will be happy to see you.